My buddy Erik and I were out for a short paddle in Toronto this morning and had a funny experience. The plan was to go out the Toronto Harbour via the Western Gap then out and around Ontario Place (8.6km). Paddling just south of Ontario Place one of the marine police boats went by us on a regular patrol. After it went by we did a bit of surfing from catching the waves from the boats wake. Just then the boat did a 180 and came back our way. The cop sticks his head out of the boats cab, "hey, you guys want us to make some waves?" So we spent the next 15 minutes playing around while the police boat drove around us. Pretty sure they loved it as much as we did. Take a look at this crazy photo (shot by Andy Barrow) that my friend, Liz Burnside found while searching through Flickr for Toronto kayaking photos. She sent it my way and I did a double take when I realized that was a photo of me out paddling during a winter storm last January. I’m not sure where my friends Erik and Rob are but quite likely right in the middle of that mess. Click on the image above for zoomed in version of it. For those who might be interested, I was testing out a new Greenland blade from Adanac Paddles that day which is part of a long-term gear review of which should be finished up shortly. Spoiler alert: the paddle worked out great. This photo was taken here right up against the north wall of the Island airport in the Western Gap of Toronto. Here is also a collection of photos that I took that cold day in January. My photos are not near as big looking as I was way too scared at the time to reach for my camera. This past weekend was the annual MEC Toronto Paddlefest and once again it was a hugely successful event with over 618 people pre-registered and approximately 120 people walking in and registering on the spot. That doesn’t include the 60 or so instructors, boat helpers and staff running around keeping the machine running smooth. With those numbers, it’s easily one of the biggest events of its kind in North America. This year I had the pleasure to teach a bit on the water but to also teach a bunch of on-land sessions including weather, navigation and technology in the wilderness. Over the years I have taught lots of symposium kayak sessions so it’s sometimes a nice change for me to get out and stand on dry-land every once in a while. This was the first time that I was asked to run a session on technology in the wilderness and they wanted me to talk about personal locator beacons as well as more recreational focused devices like the SPOT or the Delorme inReach. I decided to expand the session topic a bit and try to put this technology in a bit more context by also exploring the Canadian Search and Rescue (SAR) system and explain to people how that monster works and what exactly happens when you hit that SOS button or activate your PLB. It made it a bit more interesting then just listening to a sales pitch about gear as you could get that by going to your local store and talking to the sales lady. Of course teaching and running clinics are fun; but for me the real attraction of the weekend is hanging out with the other instructors who come into Toronto for the event. This year we had a bunch of out-of-towners including my podcast partner-in-crime, Kelly Blades, Michael Pardy, Sharon and Alec Bloyd-Peshkin, Paul Mason as well as my local Ontario friends who are always supportive and make their way south to Toronto. Special thanks for Mountain Equipment Co-Op for putting on the event once again. This past weekend was able to get out to the annual Toronto Outdoor Adventure Show. While I mainly go visit friends from around Ontario who I haven’t seen since warmer weather I also like to take a quick pass up and down the rows at the show to see what’s up. For me, it doesn’t take long to make the rounds once all the travel booths are knocked out (which is about ½ the show) and all the booths hocking shoe polish and better rags to clean your glasses (no streaks!). I will admit I did get distracted by the booth selling one-piece micro fleece outfits. I don’t know what they were thinking as they were more like a form fitting snuggie then anything else. Heading down one row I was stopped in my tracks when I came upon a small booth by a canoe company I had never heard of before called Northern Sound. They are a new manufacturing company from the UK who make Birch Canoes that are absolutely the most beautiful things I have seen in a very, very long time. Northern Sound aims to replicate the feel of birchbark canoes using both traditional materials and historical designs. Since birchbark is extremely limited in supply, the hulls are made from laminated Birch while the gunwals, ribs and thwarts are all made from Cedar. Keeping everything together are lashings made from Willow and Spruce root. The pitch they add to the hull to seal up the cracks has been formulated to still be soft yet not dry out and shrink like regular tar does. The prices for these boats are not cheap. What you are paying for a custom built, handmade boat that is pretty much a work of art on the water so depending on the model, they range from about $2500 up to about $5400 Canadian. Talking to company president Roberto Corradi, I found out that they would like to expand into North America so they shipped the boats over from the UK to try to work out some manufacturing/distribution deals. I really hope that they are successful I would love to them out on the water on this side of the pond. I got the latest issue of Adventure Kayak (Summer/Fall 2011) and was pleased to discover that one of my photos had been selected for their photo themed issue. Actually the photo was discovered by one of my kids who grabbed it from the mail and started flipping through it before I could get my grubby hands on it. This photo was taken inToronto’s Western Gap during a cold January day back in 2010. Long time readers will remember the Western Gap as a section of poorly designed break walls that tend to capture energy and hold-in waves rather then dispersing them as a break wall should. 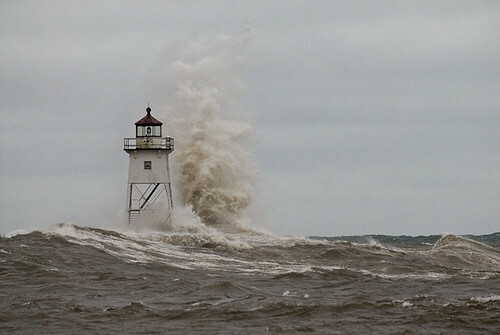 It’s so well known in the local nautical world that most sailing guidebooks about the great lakes warn you to stay out of the area if there is any wind blowing out of the southwest. Jealous that I can’t make my way to Canoecopia this weekend, I decided to troll through my friend Birgit's Facebook gallery of photos from the Toronto edition of MEC’s Paddlefest last year. As you can see it’s really more about having fun then anything else. The dates for the 2011 Paddlefest were just announced and this year it is taking place June 11-12 at Sunnyside Beach right in the heart of Toronto. Fun fact: Did you know that MEC Paddlefest Toronto gets more people on the water then any other event in North America? Yep, it’s true. When clinics are about to start it seems like there are 10,000 people running around the beach all trying to find their canoe or kayak. Well not 10,000 but at least 8 of us that’s for sure! Here is what I love about Paddlefest. It is completely an urban paddling event taking place in downtown Toronto on Lake Ontario. With Toronto being a true cosmopolitan city, the participants at the event reflect that huge diversity. It’s a completely different atmosphere then anything you have ever been to before. At least ½ of all the students in my clinics had never been in a canoe or kayak before and it’s so exciting introducing large groups of new Canadian’s to paddling. You can get more fun facts and all the details of the event via their website meca.ca/paddlefest. If you are thinking of going, make sure you book first thing on May 29th when registration opens. Last year all 800+ clinic spots completely sold out in just over 24 hours. That’s a true fun fact. This photo of Costain Leonard taken in Toronto on Lake Ontario reminds me that it’s going to get cold soon which means...wind and waves! Taken from the Sea Kayak Canada Photo Pool on Flickr. This weekend is the Mountain Equipment Co-op hosted Paddlefest here in Toronto. For those who haven't been there before, Paddlefest is an urban celebration of canoeing, kayaking, and dragon boating. It is similar to other symposiums out there in that there are more land and water clinics then you can shake a stick at but it is a touch different in that they have been working really hard to have clinics that really cater to beginner paddlers.